Through tragedy, Jim Serrill discovered he had a lot of love to give. That will be the subject of his TED talk. Despite the occasionally pilfered vegetable, Jim Serrill refuses to build a fence around his community garden. The garden, he said, is there for anyone who needs it. Ask people who know him, and they’ll say the same is true of Serrill. Serrill is best known among soccer fans as Timber Jim, the Portland Timbers’ former chainsaw-wielding mascot, but for those who cross his path these days, he’s nothing short of a hero. On April 9, 2016, Serrill will share his ethos, “spread the love,” when he gives a TED talk at Keller Auditorium in Portland. Timber Jim originated in 1978 after Serrill asked Portland Timbers’ management if he could bring a chainsaw to matches. Reluctantly, they agreed. He soon added a bass drum, a zip line and other sky-high feats. He was the first to lead the crowd in chants and song, a tradition that holds steady today. Instantly, he was a hit. Following in the footsteps of his father, he was a “tree man,” he said. He worked in the timber industry and trimmed trees around power lines for Portland General Electric. Hanging from rafters and scaling an 80-foot spar pole during soccer matches came naturally to Serrill. Timber Jim officially retired as mascot in 2008, passing the chainsaw to Timber Joey. It was after his family suffered an unimaginable tragedy that Serrill came to fully understand how much love he had to give. He was performing for fans at a Portland Timbers match in 2004 when his daughter Hannah, the youngest of three, was killed in a car accident. Her boyfriend, the father of her 2-year-old, fell asleep at the wheel. Hannah was in the passenger seat, sleeping in a reclined position, which caused the seatbelt to catch her neck. Everyone else involved in the collision survived. Twelve years after the accident, the moment Serrill begins to utter Hannah’s name, his soft blue eyes begin to brim with tears. “I was destroyed. Had to quit my job. Couldn’t do power line work anymore. Couldn’t keep it together. I was just so depressed. But all my guys at work – they carried me,” he said. “That kind of love really made it so we – my wife, Diana, and I – could cope with it. Jim Serrill, aka Timber Jim, retired as the Portland Timbers' mascot in 2008. In the years since, Serrill has given back unequivocally. Using his status with the Timbers to leverage donations, he’s helped raise tens of thousands of dollars for Portland-area charities. “Jim has a big effect. He is so generous and so loving and so positive,” said Cody Goldberg. Goldberg met Serrill six years ago when he was trying to raise money to build a playground where kids with disabilities, like his daughter, Harper, could play. Serrill caught wind of the effort and contacted Goldberg to see how he could help. “It’s really hard to put it in the right words,” Goldberg said. Serrill sold scarves with proceeds going to Harper’s Playground at every Timbers match, and with the help he solicited from the Timbers Army, $86,000 was raised. Today, the all-abilities playground in North Portland’s Arbor Lodge Park is a popular destination for kids with disabilities. Goldberg and his wife have two more inclusive playgrounds planned for other Portland quadrants, and Serrill is still championing their cause at fundraising events. He also created the Timbers Army CPR program, which hosts free CPR training for anyone who wants to learn. Serrill said he’d often share the story of his daughter’s car accident with CPR students. His friend, Montgomery, is a paramedic who expanded and now runs the program. Serrill asked him to help with it in 2012, and since then, more than 400 people have participated. Serrill’s raised money for cancer research too. 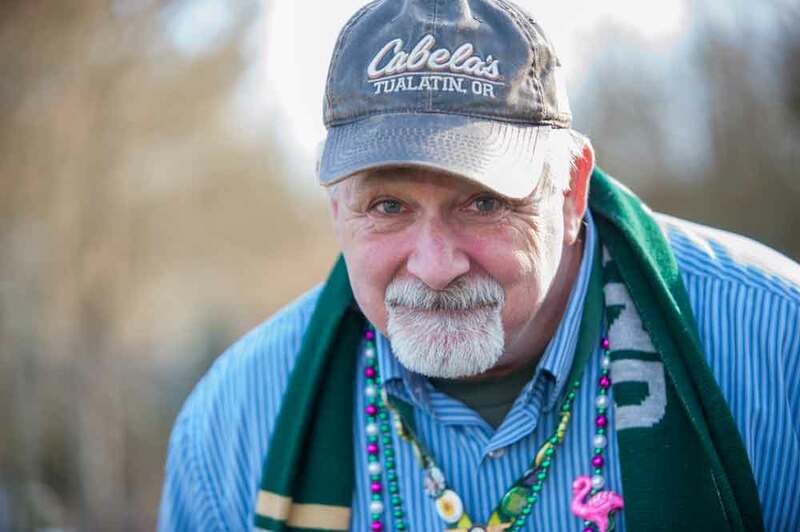 In 2012, he sold wristbands, hosted Timber Jim’s Cancer Killer Auction and solicited donations through the Timbers Army to raise money for the Leukemia & Lymphoma Society. It’s a cause close to his heart because he’s had his own battle with prostate cancer since his diagnosis four years ago. He underwent seven weeks of radiation treatment, and ultimately, it forced him into early retirement. “It took all my strength. It fried everything,” he said. Eventually he had robotic-assisted surgery at Oregon Health & Science University. Now, he said, the only thing missing is his strength, but you wouldn’t know it by the long hours he spends working in the community garden. Serrill, a lifelong Methodist, joined the church’s congregation and got the ball rolling. McClure never heard of Timber Jim before meeting him but speaks as fondly of him as any Timbers fan. Children living in the apartment buildings nearby often take gardening lessons from Serrill during the summer. This past growing season, Serrill delivered 3,400 pounds of produce from the garden to Tualatin School House Food Pantry, providing food for more than 700 hungry families each month, he said. Even in late February, signs of life poked through at the Hilltop Community Garden, with collard greens and rosemary in full swing. “Most of the work in gardening is preparing the soil, then you put the seed in, and God does the rest,” Serrill said. Soil will be his focus when he visits Tanzania this spring. Ashley Holmer, of Lake Oswego, asked him to make the trip. She needed his help. The Red Sweater Project operates a school in Mungere, Tanzania. Building the soil will be Jim Serrill’s focus when he travels to Africa to help with the school’s garden, pictured above. She’s the founder and director of the Red Sweater Project, a nonprofit that operates a school in the Tanzanian village of Mungere. In rural Tanzania, the average family income is about $200 per year, but the average secondary school costs $500 per year, putting it out of reach for most families. Her school is much more accessible at $20 per year, and it places an emphasis on ensuring girls graduate. Growing up, Holmer knew Serrill as Timber Jim. A champion soccer player herself, she attended Timbers games, high-fiving him as he walked through the stands. She got to know him better when she gave a presentation about her organization at his church last spring. Afterward, he showed her the community garden. Holmer asked Serrill, who she said has become like a father to her, to make the trip a couple of times. He initially declined but supplied her with seeds to get started. However, without properly preparing the soil, which had been depleted by over-grazing, the garden failed, he said. In fall 2015, Serrill invited her to speak to members of the Winona Grange during a festival in the hopes it would help drum up more support for her organization, but he was the one most affected by her presentation. The garden will do more than supply the children with food at lunch. 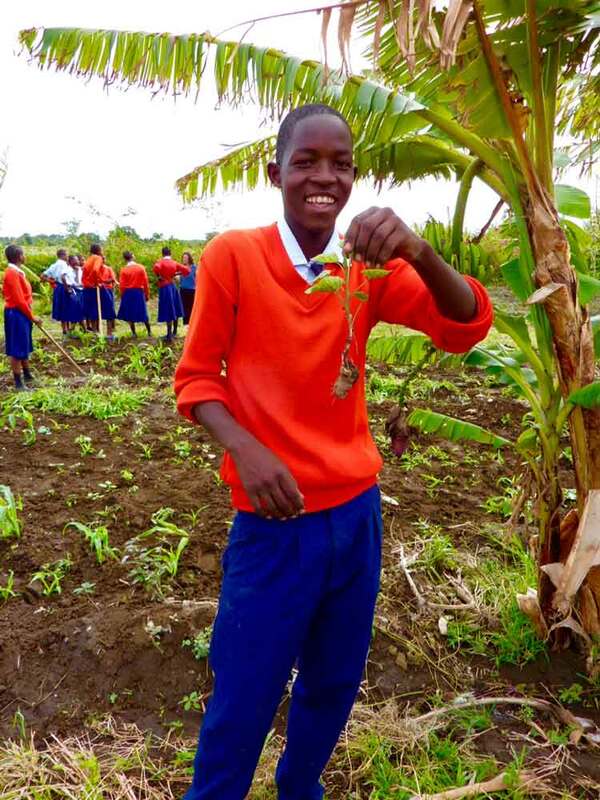 The skills they learn while gardening are vital to their survival in Tanzania, where many families earn a living off their small farms, Holmer said. The Red Sweater Project is also the benefaciery of the Timbers Army’s fundraising scarves this season. The scarves display Timber Jim’s coined phrase, “Spread the Love,” and fans can buy one directly from him at Timbers matches for $20 starting no later than April 13. Holmer said Serrill was also responsible for 22 authentic uniforms she received for her students from the Portland Timbers earlier this year. “They may not have shoes to play in, but they look great in green and gold,” she said. While Serrill’s days of hanging from the rafters may be over, he still goes to matches where he’s surrounded by adoring fans who eagerly greet him with high-fives. To this day, during every game at the 80-minute mark, the stadium erupts with the voices of thousands of fans singing Hannah’s favorite song, “You Are My Sunshine,” in her memory, as Timber Jim listens from the top of Section 109. Email reporter Emily Green at emily@streetroots.org. Where: Keller Auditorium, 222 SW Clay St. Speakers include Timber Jim Serrill, Street Roots Director Israel Bayer, Camions of Care Director Nadya Okamoto, former Oregon Ducks quarterback Joey Harrington and 11-year-old performer Bobbi MacKenzie. This recently released book by Prost Amerika is a tribute to the Portland Timber’s 2015 winning season. Available at Powell’s City of Books for $29.95, the forward was written by Timber Jim Serrill and contains photos by Street Roots photographer Diego Diaz.